A musher does not pull the sled, a team does! Team Tukaway is open to all forms of sponsorship and would love to help promote your business. We are also into product testing. If you need your equipment tested in some of the most brutal conditions on the planet, we would be happy to be your test dummies! 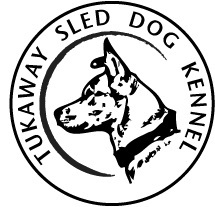 By helping us out, not only will you be joining Team Tukaway, but you will also be helping us in achieving our goals in long distance dog mushing! Check out our packages below and chose your level of sponsor! Wheel Dog: $500-$1,499: This level of sponsorship will get your business logo/name advertised on our website and facebook page. It will also get your logo/name on our dog truck which will be used for all sled dog events by providing a decal by your business. Team Dog: $1,500-$2,499: This level of sponsorship will get your business all of the promotion stated above as well as any patches provided by your business sewn onto our sled bag, dog coats and coats. Lead Dog: $2,500+ This level of sponsorship will get your business all of the promotion stated above plus provided patches from your business sewn onto all personal gear such as parka's, bibs, work coats, etc... We will also mention your business at all banquets and public events as well as wear any provided merchandise when conditions permit. Chose your level of sponsorship for team Tukaway for the 2015/16 season!